The Coat of Arms Halls (Wappensäle) were given their modern outlook as late as in the 1960s. Until then, the premises housed the collections of the municipal arsenal, which were later relocated to the new building of the Historical Museum of the City of Vienna in Karlsplatz square. 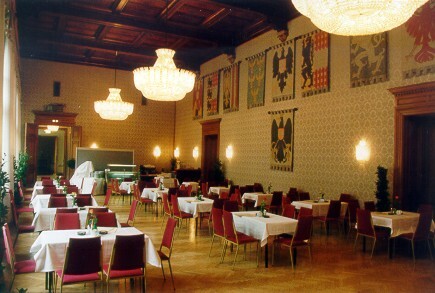 The "Little Wappensaal" features wall-hangings representing the coats-of-arms of all nine federal provinces and the Republic of Austria. Its larger companion offers us a glimpse of the stylised coats-of-arms of the provincial capitals. Moreover, both halls impress with ornate coffered ceilings (inlay work), massive lead-crystal chandeliers and silk damask tapestries under monument protection. The Grand Staircases I and II are amongst the architectural highlights of the City Hall. 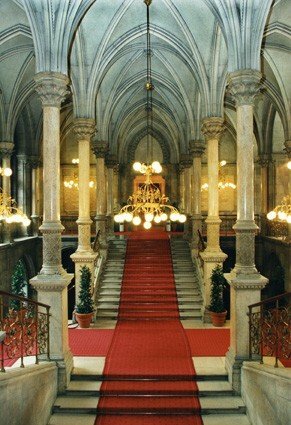 As everywhere in the building, stones from different regions of the Austro-Hungarian monarchy were used. The broad, steep flights of stairs with wrought-iron railings are bathed in brilliant light effects created by the multicoloured tracery windows. From between columns and pointed-arch vaults, visitors may enjoy a variety of aspects of these magnificent stairways. At mezzanine level, we find the longest cloakroom of Austria, designed in the historicist style. The coat-of-arms of Vienna, conferred on the city by Emperor Frederick III, is chiselled above the entrance to the Festival Hall (via Grand Staircase I). The cloakroom at mezzanine level of the Grand Staircase I is 50 metres long and can accommodate up to 1,700 hangers.